Flying was highly romanticized and young men yearned for the freedom of the air and to "touch the face of God." Picture Copyright 2013, Bob Eull Used with permission of the artist. 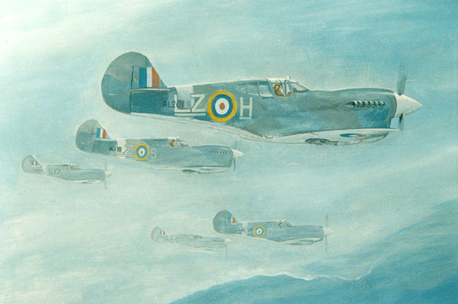 ​And the RCAF knew how to capture that imagination. ​building in the Country in the early 1940s. War was "Adventure in the skies!" C'mon for the adventure! ​Military aviation had a nasty and dangerous side to it. Many pilots did not survive the war. Some did not survive their stint with 111 Squadron. On December 27, 1941, Sergeant Pilot Charles Benjamin Pierce, crashed and was killed. It was a training accident. ​He was buried in Bayview Cemetery, Port Rowan, Ontario, Canada. ​April 19, 1942, Sergeant Pilot Douglas Leslie Stapleton crashed at sea and was lost in a training accident. His body was never recovered. The Pacific Ocean is his burial ground. and drowned in a training accident. ​​July 7, 1942, Pilot Officer/ Pilot Donald John Sterling died in a routine training accident. The aircraft he was flying was a Cessna Crane (#8671), a wooden multi-engine primary trainer (The one shown here is currently on display in the Canadian Heritage Warplane Museum). Two other airmen were with him and were also killed. They were Sergeant (Pilot) Harold Milton Miners (age 20) from Saskatoon, Saskatchewan and Aircraftman 1 Edmund James Delaney, 31, from Toronto (a member of the Ground Crew, along for the ride, I think). They were part of RCAF Squadron No. 147 (Bomber Reconnaissance) and flying out of their home base of Sea Island (Vancouver). Sergeant Miners' Great Nephew has his Great Uncle's Flight Log. It shows that P/O Sterling and Sgt/Pilot Miners, in recent days, both had had a turn at being First Pilot in training flights in Cranes. Indeed, F/O Sterling was First Pilot on the fatal flight. Both were young men of 20, new pilots, transitioning into multi-engine aircraft. Sgt/Pilot Miners, at #2 SFTS, Uplands, Ontario, had trained as a single engine pilot, probably slated to be a fighter pilot. When he arrived at Western Air Command, his first assignment was to 14 Squadron, a P-40 fighter squadron. He was there only a couple of weeks. Then he was reassigned to 147 BR (bomber) Squadron on June 15, 1942. 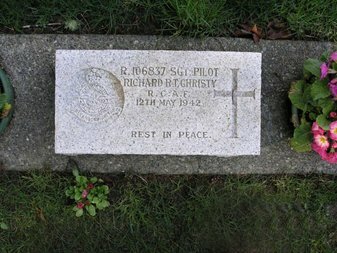 His flight log showed that, after arriving at 147 Squadron, he had had some orientation flights in multi-engine aircraft and that he had flown the Crane as First Pilot. But his training in multi-engine craft was not complete. In the fatal flight, these young pilots were flying routine training circuits, familiarizing themselves with the different handling characteristics of multi-engine aircraft. Once fully operational, they would have been flying Bristol Bolingbrokes on anti-submarine patrols in the protection of Vancouver and Victoria. Later on, their squadron moved on to Tofino, Vancouver Island but without them. They crashed and burned three miles east of Sea Island, on Lulu Island. The cause is not known. I am grateful to Sergeant (Pilot) Miners' Great Nephew, Hi Brooks, who has been trying to learn as much as he can about his Great Uncle's wartime experience and his death. He enclosed this photograph of the newly-minted pilot, Sergeant Harold Milton Miners, age 20, standing in front of his parents' home in Saskatoon, Saskatchewan, on leave, while he transited from "Y" Depot, Dartmouth, Nova Scotia (Eastern Air Command) to Vancouver (Western Air Command). He had completed pilot's basic training in Ottawa and, I think, was sent to "Y" Depot to prepare to go overseas. But in mid-1942, after the Japanese attack on Pearl Harbor, the RCAF, which had been preparing primarily to have pilots and airmen ready to go to Europe, suddenly redirected a lot of trained people to the west coast. Sergeant Miners was one of them. So was P/O Sterling. It was not unusual, under those circumstances, to retrain fighter pilots to fly bombers, because they were using light bombers for anti-submarine patrols over the ocean. At the time he joined 147 Squadron, it was just forming. It would not become operational until November 7, 1942. ​He was the son of C.M. and Emma Miners. 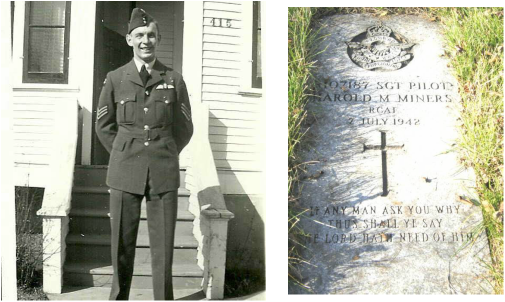 Sergeant Pilot Miners was buried at Woodlawn Cemetery, Saskatoon, Saskatchewan. ​I know nothing about AC1 Edmund James Delaney, 31, who died with him. If you do and would like to share with others, I would be pleased to post it here. ​July 16, 1942, Squadron Leader (Pilot) John William Kerwin crashed into fog-obscured mountain, Unalaska Island, Alaska. July 16, 1942, Sergeant (Pilot) Stanley Ray Maxmen crashed into a fog-obscured mountain, Unalaska Island, Alaska. July 16, 1942, Flight Sergeant (Pilot) Gordon Douglas Russel Baird became lost in a relocation mission, died at sea. July 16, 1942 was a profoundly tragic day for 111 Squadron. Five pilots and seven planes were lost in one mission. The squadron had been ordered to leave Elmendorf and make their way to Umnak Island in the Aleutian chain. "July 13, 1942 Local flying and some formation carried out, and some instrument flying. W/C McGregor and six pilots left Elmendorf enroute to Umnak and Cold Bay, On the way to Umnak Flt/Sgt Schwalm was forced to bail out due to failure of the entire electrical system. On arrival at Naknak P/O Lynch crashed on landing. W/C McGregor and S/L Kerwin took off from Naknak to search. They were unsuccessful, but a DC3 Transport piloted by Captain Fillmore, U.S.A. Air Corps sighted Schwalm and on landing at Naknak returned with emergency rations, maps, and first aid kit. Two D.C. 3 Transports left at the same time as our flying pilots, transporting seven pilots and twenty-six men. An advance party consisted of F/O Cowan, the Medical Officer, F/O Paynter and eleven men left at 08:30 hours for Cold Bay, enroute to Umnak, arriving Cold Bay at 13:00 hours. July 14, 1942 The advance party departed Cold Bay for Umnak at 13:00 hours, but were unable to get through due to weather conditions. W/C McGregor returned to Elmendorf to collect two more pilots and aircraft and to find out what was being done regarding F/Sgt Schwalm. In the meantime, the "Alaska Star Airlines" had picked Schwalm up at Lake Iliana. W/C McGregor returned to Umnak with P/O Eskil and F/Sgt Baird arriving at 17:40 hours. July 15, 1942 Weather bad today. Pilots unable to leave Naknak. Good sample of camp life eating everything off one plate and using a wooden spoon. July 17, 1942 Two of our P40's were located in the morning on a hillside on Unalaska Island. A search party left by boat from Umnak, located the aircraft , and identified P/O Dean Edward "Whitey" Whiteside and F/Sgt Frank "Pop" Lennon. The bodies were brought back to Umnak. W/C McGregor arrived at Umnak." Two others, Sergeant Pilot Stan Maxmen and Squadron Leader John William Kerwin, had also slammed into the mountain in the fog. Flight Sergeant Gordon Douglas Russell "Gordie" Baird became disoriented and probably flew until he ran out of fuel, crashing into the sea. He was never seen again. Five pilots and seven aircraft lost in a relocation mission. The Daily Diary version of the tragedy is terse and maddeningly without detail. What we do get is that the weather conditions were terrible and that communication was difficult, both within the formation and with ground and other support aircraft in the area. It is hard to imagine just how isolated a pilot is under such conditions and how vulnerable. "After rounding Makushin Cape (Unalaska Island) and altering course to roughly follow the shoreline - weather became progressively worse. Fog banks and showers continually appeared to the north. We flew through several areas about 50 feet above the water. I could hear F/L Kerwin talking to Captain Fillmore (in an American C-53 support aircraft) intermittently but they seemed to be making very poor radio contact. I could not tune either one clearly.... The air seemed clear near the water but visibility was very poor - much impeded by large areas of dense fog and showers. We were forced very near the water. ... we were forced right along the shore by a dense fogbank about 200 yards offshore. We were forced to about 20 feet from the water and I estimate the ceiling at about 50 feet. We were flying with the Wing Commander leading a "VIC" consisting of F/L Kerwin's section (with Maxmen) and Pilot Officer Whiteside's section (with Lennon) on the starboard of the Wing Commander, and my section (with Baird) off the port. Sections were about three to four spans apart and ships in the sections slightly closer. F/Sgt Baird had overtaken me and slid over abruptly, forcing me to pass through his slipstream. We were very low and I dropped back slightly while righting my ship. As I was moving up to form on F/Sgt Baird's port wing, the Wing Commander ordered a turn to port. I was trailing the Wing Commander and Baird by 100 yards when the turn began. I was too low to drop into proper position for a turn and thus lost sight of all the other ships when I began my turn. I turned as tight and as low as I dared but sighted an aircraft well ahead of me cutting me off. Afraid that I would fly into the green beneath me continuing my turn and increasing throttle to about 37 Hg. My gyro horizon was out so I had trouble in maintaining steep climb and turn. At about 500 feet freezing mist appeared on my windscreen so I undid my harness and removed my oxygen and radio connections - intending to bail out if I stopped gaining height because of icing. At 4800 ft I broke through between cloud layers, continued to turn and plugged in my radio... (After being momentarily disoriented by cloud and fog and making a couple of course adjustments) In a few minutes I ended up in what turned out to be the only hole in the area and sighted the Umnak air base... I phoned Captain Fillmore to clear me so I would not be fired on and proceeded to land..."
By the time P/O Eskil was plugging in his radio, four of his fellow pilots were dead. And one was probably flying in circles. Sgt Baird wouldn't have known his fate until his fuel ran out. He must not have heard McGregor, or Fillmore or Eskil calling for him. He might have heard McGregor's order to the formation to turn left. He was turning left when he crossed in front of Eskil. If so, that was his last connection with his squadron. "111 and the Enemy Ace - by Steve Tournay A five-plane flight of 111 Squadron P-40 Kittyhawks flying into fog over Unalaska Island during their Aleutian detachment; all five subsequently crashed on a hillside on Unalaska. (I have very recently learned that AL138, the second Kittyhawk from the viewer's position, was recovered from Unalaska and is stored pending eventual restoration)." In fact, it was a seven-plane flight from which four pilots flew into the mountain on Unalaska Island. The fifth became disoriented and, while he did miss the mountain, he became lost in the fog and probably crashed into the sea when he ran out of fuel. In any case, he was never heard from again. Tournay's reference to "Enemy Ace' in the painting's title derives from the definition of Ace. The term stems from WW1 aerial conflict. A pilot earned the title Ace when he had destroyed, in aerial combat, five enemy aircraft. Tournay's use of the term salutes the weather as the greater threat to flyers in the Aleutians. In this one incident, five aircraft and their pilots were brought down by the more dangerous enemy: the weather itself. Click here to see more of Steve's work and that of many other superb Canadian artists who specialize in aeronautical art. This photograph tells the whole story of flying into the mountain on Unalaska Island. The man, a friend of photographer Jeff Dickrell, is sitting beside the engine of one of the 111 Squadron's P-40s, I believe it was part of the plane flown by Sergeant (Pilot) Maxmen. Judging from the angle of the engine (and allowing for 70 years of erosion and tampering) it appears that the pilot was desperately trying to pull up. He did not have enough time. Straight behind the aircraft was Dutch Harbor. They had passed over it but, never having been over Unalaska Island, they did not know about the very high sloping mountain until it suddenly loomed out of the fog. The Daily Diary said that the ceiling was 50 feet above sea level. The tallest mountain on Unalaska is about 6,000 feet high. They never had a chance. But apparently it was a near thing. In fact, Flight Sergeant Maxmen's first name was Stanley Ray, not Gordon; Max Crandall also made a mistake about the name of another of the victims in this tragic event but his memory for detail seemed pretty clear and perhaps indelible, in his mind, when describing what they actually saw. Of course, Sergeant Pilot Baird has no grave marker. However, his name is inscribed on the Ottawa War Memorial, Ottawa, Ontario. 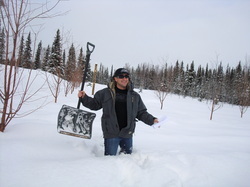 "In 2009 I drove to Alaska before my grandma passed (she never saw her brothers resting place when he passed) and got a pass to visit the graveyard on the Army base in Anchorage. I received a plot plan and dug my way through and have pictures of where 111 squadron were laid to rest. I have quite a few pictures of Uncle Stanley's Head Stone. After reviewing your site and talking with my grandpa, I was wondering if you would be interested in a copy of the pictures. Thank you for your time and effort devoted to the memory of so many families' lost loved ones." There are four members of 111 Squadron buried in this small cemetery: S/L John William Kerwin, P/O Dean Edward Whiteside, F/S Stanley Ray Maxmen and F/S Frank Robert Lennon. Their grave markers are shown above. Also buried there is F/L Dufferin Nelson Wakeling who was attached to 14 Squadron but had a temporary attachment to 111 Squadron. They lie with other servicemen who died in service in Alaska. At the end of the Aleutian mission, 111 Squadron was redeployed to Europe to be part of the final push to finish the war there. They were renumbered as 440 Squadron because the Royal Air Force had a 111 Squadron and having two 111 Squadrons in the same theatre of war would have been too confusing. Many of the 111 Squadron pilots went to Europe but not all flew with 440 Squadron. October 6, 1942 Flying Officer/ Pilot Gerald Pringle Johnson collided in his first operational scramble. July 30, 1944 Flying Officer/ Pilot John William Lippert failed to return from a raid near Bretteville, France. 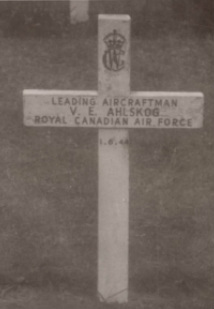 June 1, 1944 Leading Aircraftman Victor Edward Ahlskog died when a 418 Squadron Mosquito he was riding in crashed in England. To get an overview of the types of ground based anti-aircraft weaponry the pilots faced, press here. To put the 111 Squadron losses in proportion to the overall aircrew losses on both sides, press here. Thanks to TSJ Inc. who compiled the statistics and did the analyses on aircrew losses and anti-aircraft weaponry.